We’re now offering Star Wars BB-8, Marvel Iron Man and Disney Frozen bionic arm covers for free to limb-different children and adults with every Hero Arm. 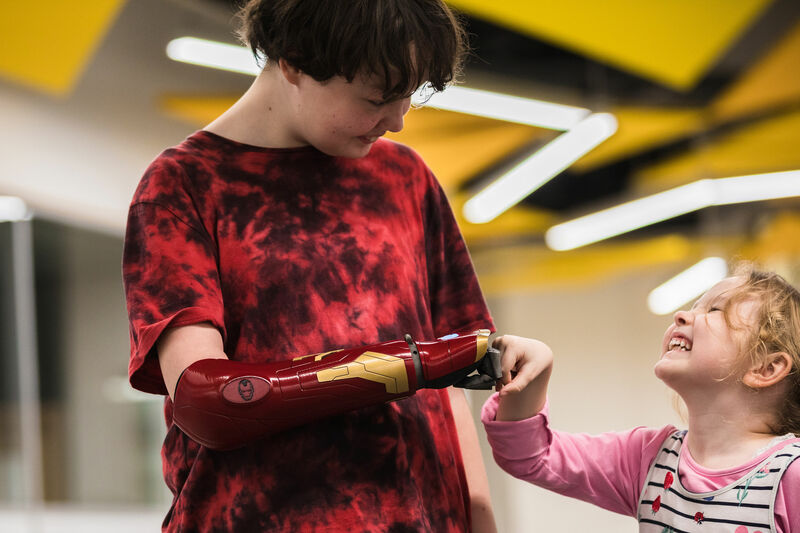 11-year-old Cameron Millar, 11-year-old Evie Lambert and 12-year-old Raimi Davis were amongst the first to receive a bionic Hero Arm that now comes with 3D-printed Disney-inspired covers. The Hero Arm and the Star Wars, Marvel, and Disney Frozen covers for the Hero Arm are custom-made using innovative 3D-printing and 3D-scanning techniques. Cameron Millar from Edinburgh is 11-years-old and was born without a right arm. He now has new Star Wars BB-8 covers for his Hero Arm. Cameron said: “I love the Hero Arm and these new covers. 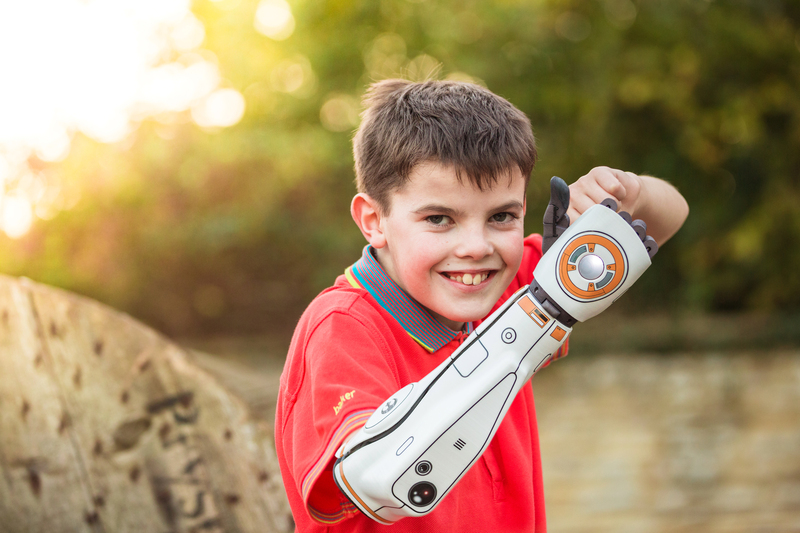 I feel a lot like Luke Skywalker, my favourite Star Wars character, because he has a bionic hand too.” Cameron and his family crowdfunded for his Hero Arm in just three weeks. 12-year-old Raimi from Street was born without an arm as a result of amniotic band syndrome. She loves Iron Man and was blown away by her new Iron Man covers for the Hero Arm. Raimi said: “When I first saw my Iron Man covers, I felt amazed. They are very unique and they’re so cool. Before getting my Hero Arm, many people just stared at me in public. 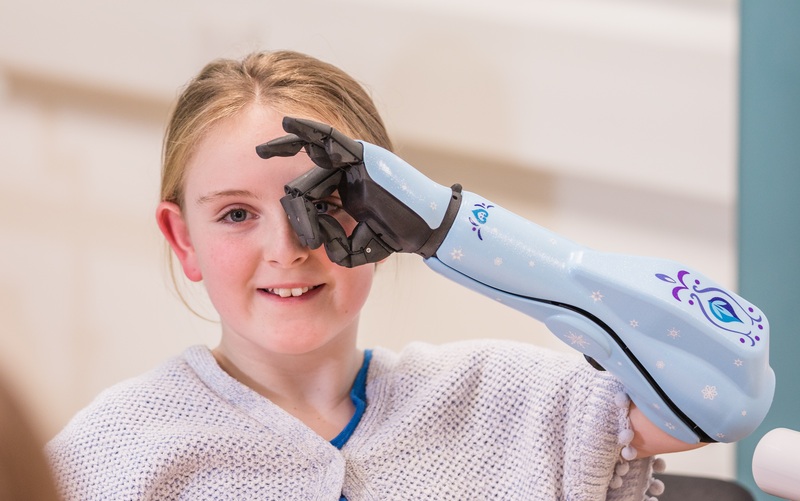 But now that I have it, it gives me more confidence.” Open Bionics gifted Raimi with a Hero Arm as a thank you for taking part in the first stage of the NHS trial. 11-year-old Evie Lambert from Huddersfield, was born missing her left arm. She’s struggled with basic skin-like gripper arms offered by the NHS, and has asked Santa for a bionic arm. She recently received a Hero Arm with official Disney Frozen covers. Evie said: “It’s really, really cool to have my bionic arm. I can now pick up a cup and brush my hair with my left hand, which I’ve never been able to do before.” Evie’s Hero Arm was funded by an external anonymous donor. We’re really grateful to Disney, Lucasfilm and Marvel for allowing us to find inspiration from their incredible characters and stories; this has helped us to empower children and adults with limb differences. The Hero Arm Disney covers are easy to take on and off, allowing children to accessorise their bionic arm to match their mood. They can wear their Star Wars BB-8 Covers at school, for example, and then change into their personalised blue Spectrum Covers in the evening. The covers showcase that your uniqueness is your superpower and you shouldn’t feel like you have to hide your limb-difference – instead you can show it off.